The fallout from another explosive Old Firm clash rages on. But Scottish football isn’t alone in having an almighty mess to clear up. I don’t know what’s going on at the moment, but the beautiful game is showing its ugly side all around the world. 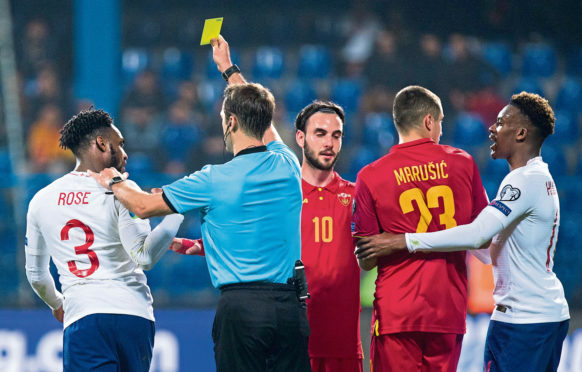 From sectarianism, stabbings and bottle throwing in Scotland, to players being assaulted on the pitch by fans in England, to the racist abuse dished out to England players in Montenegro, things are looking really grim. If you’re looking for an easy solution, you won’t get one from me. No single thing is going to solve football’s problems, because they are society’s problems, too. But when you hear a young English player, like Tottenham Hotspur’s Danny Rose, saying he can’t wait for his career to end after being subjected to racist chanting on England duty last month, you can’t hide from the fact that something needs to be done. FIFA and UEFA have a part to play. And probably a bigger one than they currently do. Rose is right that the punishments dished out to countries, whose fans target opposition players on the basis of the clour of their skin, don’t fit the crime. But the governing bodies are in a tricky position, as fining associations doesn’t hit fans where it hurts – and they are the ones whose behaviour is in question. At club level, punishing clubs rather than individuals is also open to abuse. It’s why I think the clubs in Scotland who are against the introduction of “strict liability” are right. If you’re a daftie – and there are plenty of them about – and you know you can get a rival club docked points, or have their stadium closed if you go to one of their games and misbehave, what would stop you and your daft mates from doing it? I’m not saying that would definitely happen – but it’s definitely possible. So, for me, the real answer to the problem lies mostly away from the football authorities. I want to see the kind of horrible behaviour England’s black players were subjected to in Montenegro punished harshly by the courts. I want to see racists and thugs locked up. That’s the best way to get the message through to these idiots that their behaviour is completely unacceptable. I’d jail the Montenegrin racists, just like I’d jail the knife-wielding animal that stabbed a Celtic fan in the neck after last Sunday’s Glasgow derby. When it comes to racism, the legal approach has worked pretty well in the UK. In my playing days, you’d hear racist chanting at games all the time. Nowadays, it’s not so frequent – and it’s usually highlighted in the media. If players start to walk off the pitch when they’re on the receiving end of racism, it will be highlighted even further. However, I’m not a huge fan of that idea, to be honest. Again, it’s because it’s an example of football trying to deal with a social problem, and I’m not sure that will solve anything on its own. If certain clubs, or countries, have a fanbase that offends repeatedly, then I’m all for football taking steps in-house. That’s when FIFA, UEFA and the national governing bodies should get more involved. They should issue fines, and they should even close stadiums. But that will only solve the problems plaguing the game at the moment if the justice system works, too.